This Cornmeal Scone, as its name implies, contains cornmeal which adds a pleasing hint of nuttiness and a little crunch. They are baked in a hot oven which turns the outside crust golden brown and crisp, yet inside they are soft and tender. I like to stir some currants, which are dried tiny dark seedless Zante grapes, into the dough for sweetness. If the currants are nice and soft, nothing needs to be done before adding them to the scone dough. But if they are a little old, that is, they've become hard and dry, you may want to first soften them in water, orange juice, or even rum or brandy, before adding them to the dough. A Cornmeal Scone is different than Cornmeal Bread which contains lots of cornmeal and just a little flour. Cornmeal Scones are the other way around, more flour than cornmeal. Yet these scones still have the taste and texture of cornmeal. This scone is also unique in that it contains no butter. 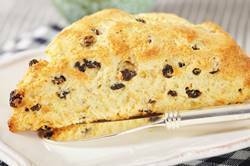 Instead, extra liquid is added, in the form of cream, which gives the scone a rich flavor with a crumbly texture while still being tender and moist. Cornmeal is made from corn kernels that have been dried and ground. It is known as Polenta in Italy and Maize Meal in other parts of the world. It comes in different colors (white or yellow) and textures with 'stone ground' cornmeal having a coarser grind. Whereas regular cornmeal is made from corn that has had its germ removed during the milling process, 'stone ground' cornmeal uses the entire grain. This gives it a more pronounced nutty toasted corn flavor and crunchy texture. Use whatever type of cornmeal you like in this recipe. When buying cornmeal make sure to check the expiration date on the container and store in a cool dry place.